"Do Wah Diddy Diddy" is a song written by Jeff Barry and Ellie Greenwich and originally recorded in 1963, as "Do-Wah-Diddy", by the American vocal group The Exciters. It was made internationally famous by the British band Manfred Mann. 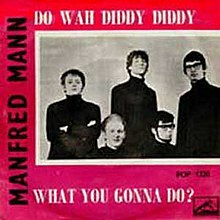 (1964) "Do Wah Diddy Diddy"
It was soon covered by British R&B, beat and pop band Manfred Mann. Manfred Mann's version was released on 10 July, and spent two weeks No. 1 in the UK Singles Chart in August, and two weeks at the No. 1 spot in the U.S. Billboard Hot 100 in October. The song has been covered many times, notably by DJ Ötzi whose version titled "Do Wah Diddy" peaked at #9 on the Ö3 Austria Top 40, as well as charting in Germany, Switzerland, the UK and Ireland. German girl group À La Carte recorded the song in 1980 and Dutch girl group Dolly Dots in 1982. American hip-hop group 2 Live Crew created a characteristically explicit cover for the 1988 album Move Somethin'. The song was used as a military cadence in the movie Stripes. The song was used as an opening and closing theme song of Ang TV. ^ D&j (5 June 2018). "Manfred Mann - Down the Road Apiece: Their EMI Recordings 1963-1966". Retrieved 3 March 2019. ^ a b c Rice, Jo (1982). The Guinness Book of 500 Number One Hits (1st ed.). Enfield, Middlesex: Guinness Superlatives Ltd. p. 82. ISBN 0-85112-250-7. ^ "All the Number One Singles: 1964". The Official Charts Company. Retrieved 13 June 2010. ^ Bronson, Fred (1992). The Billboard Book of Number One Hits (3rd ed.). New York, NY: Billboard Publications, Inc. p. 158. ISBN 0-8230-8298-9. ^ "Item Display - RPM - Library and Archives Canada". Collectionscanada.gc.ca. 1964-10-12. Retrieved 2018-02-19. ^ "The Irish Charts – Search Results – Do Wah Diddy Diddy". Irish Singles Chart. Retrieved January 14, 2018. ^ "Australian Chart Book". archive.is. 5 March 2016. Archived from the original on 5 March 2016. Retrieved 3 March 2019. ^ "Top 100 Hits of 1964/Top 100 Songs of 1964". www.musicoutfitters.com. Retrieved 3 March 2019.